Is the next Marvel One-Shot going to be all about Loki? 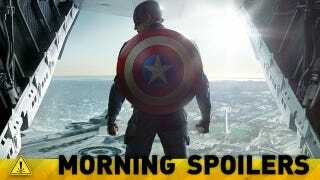 A Captain America: Winter Soldier writer explains why Cap has no character arc of his own. The Walking Dead has a new poster. And new Dracula photos show the show getting its corpse on. Plus, new photos from Arrow and Tomorrow People. Spoilers now! What helps us get past the pious Boy Scout that he could turn into is that he doesn't really want to be this guy. He would prefer to be Steve Rogers just walking down the street, helping people sometimes. … He's kind of the still centre and things happen around him and are influenced by him. It's interesting in this movie, for instance, to watch his relationship with Black Widow, who of course has a very different outlook. What made '70s thrillers interesting is that it was a very complicated time. We were peeling back the curtain with Watergate and realizing how corrupt the system was. Now, again with the proliferation of social media, you can blow the whistle on the NSA and it can be round the world in 30 seconds. And we have the morality of drones. Is it right to preemptively use them to kill suspected terrorists prior to any sort of trial? So the times we're living in are even more complex. Below's the synopsis for January 15th's "Blast Radius," and go here for more photos from that episode. Seeing Oliver shake hands with Blood and try to save him is pretty hilarious, given what we know. It's shades of last year's saving of Malcolm Merlyn. ARROW HUNTS DOWN SHRAPNEL — Oliver must tackle a new threat to the city when bombs start to go off in Starling City. Felicity (Emily Bett Rickards) discovers the person setting them off is Mark Sheffner (guest star Sean Maher), a man who goes by the nickname Shrapnel. Arrow discovers Shrapnel's next target is Sebastian Blood's (guest star Kevin Alejandro) "Unity Rally" and tries to talk the alderman out of hosting it, but he refuses. Arrow sets off to stop the bombing, but Shrapnel tricks him and traps him in a bomb-laced antique store where he is unable to move without setting off the device. While Felicity helps Oliver, Diggle (David Ramsey) races to the plaza to find the bomb before it goes off. Meanwhile, Roy (Colton Haynes) continues to hide his new strength from Thea (Willa Holland) but, after she witnesses his super strength in action at the rally, she demands answers. Laurel's (Katie Cassidy) suspicions about Sebastian grow stronger once she learns that he grew up with Cyrus Gold, the man who killed Lance's (Paul Blackthorne) partner. After Donner (guest Star Dylan Bruce) refuses to help her investigate, she turns to Arrow (Stephen Amell) for help. Rob Hardy directed the episode written by Jake Coburn & Keto Shimizu (#210). Similarly, here's the synopsis for episode 1.10, "The Citadel." Go here for more photos from the episode. BREAKING IN — After Stephen (Robbie Amell) returns from the brink, he thinks he has a clue to what happened to his father, but his fellow Tomorrow People are not sure they believe him. When the Tomorrow People learn some disappointing news from John (Luke Mitchell), they make an unexpected decision about their future. The Tomorrow People finally get a lead on Ultra's secret research lab and they devise a dangerous plan to free all those being held captive there. Meanwhile, Stephen's mom introduces Stephen and his brother Luca (guest star Jacob Kogan) to a new man she is dating, but Stephen is having a hard time getting a read on him. Peyton List, Aaron Yoo and Mark Pellegrino also star. Sarah Clarke, Jeffrey Pierce, Ty Olsson ("Supernatural") and Robert Gant ("Queer as Folk") guest star. Eagle Egilsson directed the episode written by Jeff Rake and Grainne Godfree (#110).